ITS OFFICIAL! Designers can’t rely on 3D printing alone for their Rapid Prototyping needs. Sometimes milling technology is the best option and it sits alongside 3D Printing to provide all the options for project prototyping and part production. These two technologies can now literally sit alongside each other with the new SRM-20E and ARM-10 machines from Roland DG. 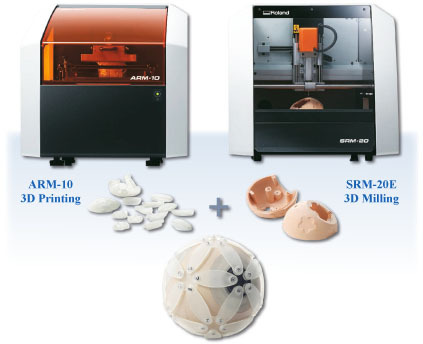 These bring together precision Subtractive Rapid Manufacturing (SRM) and Additive Rapid Manufacturing (ARM) into a ‘matched- pair’ of stylish, affordable desktop machines. Both options benefit from Roland OnSupport software – so if you love your Apps, here is one that delivers real-time reports direct to your desktop or mobile device. The SRM-20E has been designed for 3D work and is the long-awaited successor to the hugely successful MDX-15E/20E machines. The 203 x 152 x 60mm machining envelope is very generous for a machine in this class and will allow for most individual student projects. Models can be machined to fine tolerances with an excellent surface finish. To maximise work flow in a busy workshop, schools could usefully create a 3D Rapid Prototyping centre using two or more SRM-20Es rather than a single, higher capacity machine. Machines are supplied with a TechSoft Training pack, Roland utility software and are compatible with Visual Toolpath – the student-friendly way to convert .stl format files and configure 3D output. The SRM-20E is a fully featured 3-Axis CNC milling machine and so it also provides an excellent resource for PCB production or one-off 2D and 2.5D projects in plastics and common modelling materials. Output for these purposes is direct from 2D PCB or 2D Design V2 using the simple, familiar output routine. The Roland ARM-10 is a revolutionary new 3D-printing device that builds smooth, precise models using photo-sensitive imageCure liquid acrylic resin. The machine is driven by intuitive software that accepts .stl files and converts them into a series of slices that build to complete the model. Models are created by projecting an image of each slice onto the resin-wet base of a build platform. The projected UV image instantly cures the resin and the build platform rises ready for the next slice. Software takes care of any structural support needed and automatically includes this into the build. On completion, the model is washed and supports are snipped away. The glass-clear models can be left ‘as printed’ or painted as required. ImageCure resin and the solvent used to clean models do need careful handling so, in school, very close supervision will be needed.